In Burning off, Dorothea MacKellar, author of My country, celebrates the destruction of native bushland as a ‘great and old’ tree becomes ‘A red-hot column whence fly the sparks, ... And where he stood with his silent court, The wheat shall bow to the wind.’ This tree represents one of billions that were destroyed by our forefathers as our native forests and woodlands made way for wheat, cattle and sheep. Brigalow (Acacia harpophylla) is a distinctive black-trunked, silver foliaged, shrub or tree - one of the 980 species of Acacia in Australia. Brigalow is found west of the Great Dividing Range, stretching north almost to Townsville, south to Narrabri in New South Wales, west to Bourke on the Darling River and Blackall in central western Queensland. It occurs mostly on deep cracking clay soils with a microrelief pattern referred to as ‘gilgais or melon holes’ which intermittently fill with water. Brigalow is an Aboriginal name adopted by white settlers who pushed north and inland from the Hunter Valley in the 1830s and 1840s. One of the first references to Brigalow was in Ludwig Leichhardt’s journal of his expedition from Moreton Bay to Port Essington, published in 1847. The early European settlers of the Darling Downs faced a multitude of challenges in transforming the land. During the 1860s and 1870s, as people initially attempted to clear forests for pasture and agriculture, they cursed the dense Brigalow scrubs which defied the axe, fencing them off as waste country. 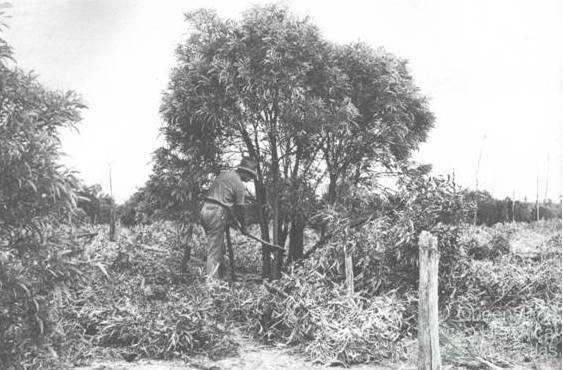 They quickly realised the ability of Brigalow to reappear as dense sucker regrowth, which was even more difficult to remove. A series of droughts affected much of eastern Australia from the 1880s through to 1902 culminating in the Federation drought of 1901-02, when up to 90% of livestock on some properties died and over the southern Brigalow livestock numbers were halved. Over these difficult times, many selectors of Brigalow country abandoned their land and moved to towns to find work. Attempts at closer settlement during this period failed, and it was recognised in The Land Acts Amendment Act 1927 that the size of agricultural and grazing properties needed to be ‘sufficient to afford a prudent selector a reasonable living area … in average seasons’. After World War I, development of the southern Brigalow lands progressed slowly, due largely to the resilient nature of the plant and the lack of technology to deal with its defences. Between 1880 and 1934, the southern Brigalow Belt was invaded by prickly pear. One might be pardoned for thinking that in those days the chief carrying capacity of the land was wallabies, death adders, snakes, and dingo packs. With the control of the prickly pear in the early 1930s, development of Brigalow lands began again although efforts were relatively slow due to lack of mechanisation. However, the settlers persevered and by the outbreak of Word War II, large blocks of Brigalow around Goondiwindi, Millmerran, Tara, Dalby and Chinchilla in southern Queensland had been cleared mainly by axe, burning and subsequent ‘flogging’ by sheep. The dominance of the settlers over the resilient Brigalow had begun. In the eight years between 1953 and 1961, 1 million ha were cleared at a rate of 120,000 ha per year. 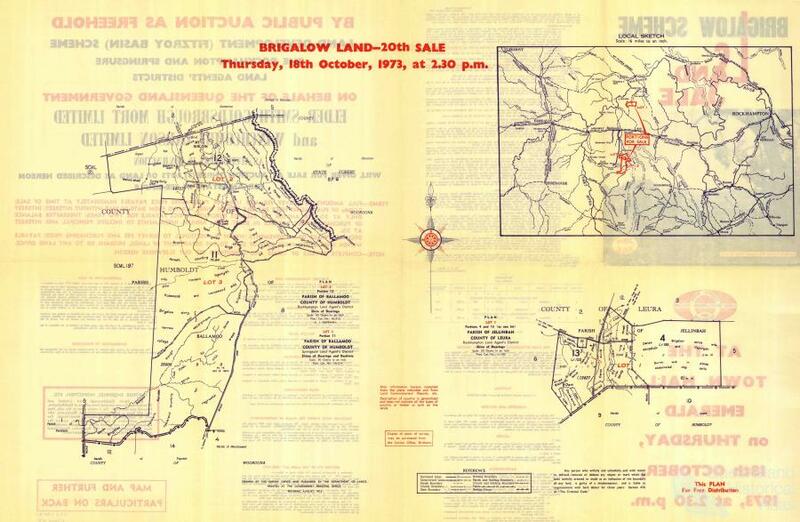 In 1962 The Brigalow and Other Lands Development Act was passed. 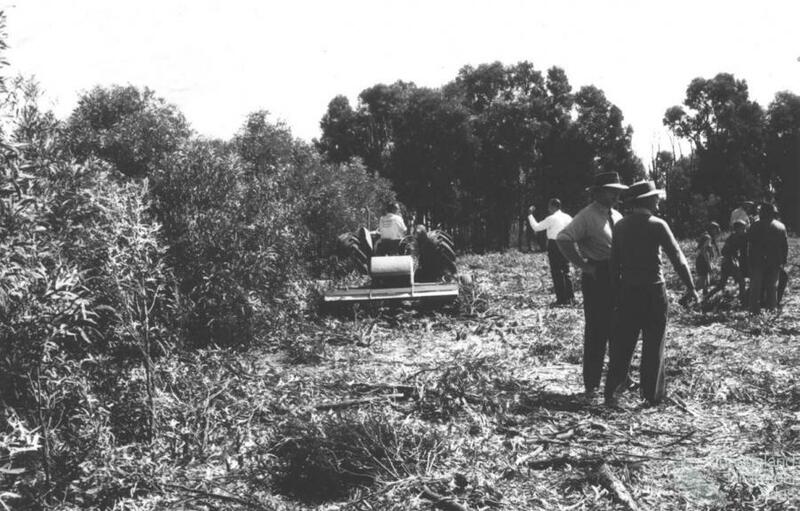 During the same year, the tree crusher was introduced into Queensland along with the rotary slasher. Under the Brigalow Development Scheme, approximately 2 million ha was allocated in Areas I, IA and II in the Bauhinia, Taroom and Duaringa districts, with a further 2.4 million ha in the Brigalow Belt North. Properties were to be large enough to stock 1000 cattle. State and Commonwealth governments provided loans of up to $60,000 for settlers to cover development costs, plus paying for the construction of 1,200 km of development roads. The Scheme was the first closer settlement policy that provided a combination of infrastructure, adequate financial assistance, and large enough blocks to provide a decent living. 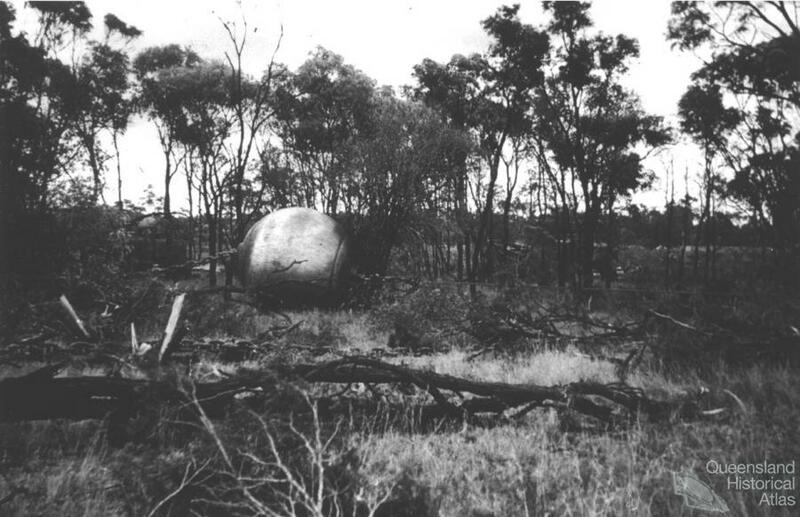 By the 1970s, most of the Brigalow scrub had disappeared. Vast areas of sucker regrowth were controlled by aerial spraying with 245T and 24D, burning and mechanical means, in preparation for improved pastures and cropping. Sheep numbers declined markedly matched by a rise in cattle numbers and the area under crops. The rise in cropping was linked to a severe decline in cattle prices in the 1970s and to the more effective control of Brigalow regrowth using blade ploughing, whereby the roots were cut off under the soil. The battle to clear the Brigalow had been won. The gain was vast new productive agricultural lands. The loss was a legacy of unforseen environmental problems including the decline of rich biodiversity. Today, Brigalow ecosystems are listed nationally as an endangered ecological community. Linear strips of black-trunked Brigalow line roadsides and paddocks of wheat, sorghum and cattle pastures, standing sentinel to the past. The sheep are almost gone. Regrowth is still a problem to farmers, but governments are now developing policies to ‘Bring Back the Brigalow’.